Parker safety razors are mid-range safety razors. They’re pretty popular on today’s market and represent one of the handful of major brands. They specialize in wet shaving products, selling safety razors, straight razors shaving cream, shaving brushes and shaving soap. The safety razors are a bit of a mixed bag. In this industry, you really do get what you pay for. When you buy a high-end razor, like a Truefitt and Hill, you get a really great piece of metalwork that is engineered specifically to provide a comfortable shave. And a lot goes into that: ergonomics, aesthetics, materials, and more. Even slightly more expensive razors, like the Edwin Jagger DE89 invest heavily in the look and feel of the razor… which is why it’s easy to get disappointed in some of Parker’s razor. Don’t get us wrong. 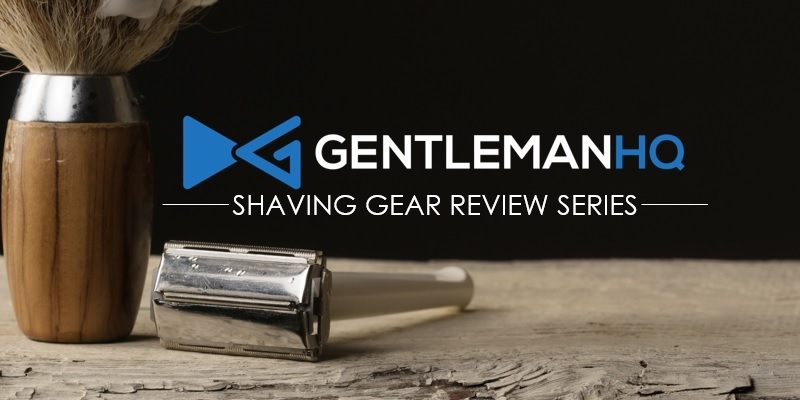 They make some fantastic razors as well, but some of their products lack the proverbial oomph of similar razors just barely outside of their price range. And that doesn’t make sense to us. I mean, what’s the difference between $35 and $50 really? That’s more or less the same market. So, often, it isn’t a question of whether or not Parker safety razors are good; rather, it’s more a question of why you would choose a Parker if you could spend $10 more and get something much better. If you buy a Parker, you can expect a fairly aggressive shave. Most of them just have that quality. It’s not the smooth, luxurious shave you’d expect from a higher-end razor. However, some guys like a really aggressive shave. Plus, because these razors are so aggressive, they often do well with longer hair. The shave isn’t the best or worst. It’s aggressive but gets the job done. Because it’s so aggressive, it may not be best for beginners. Additionally, if you have a super thick beard, you’ll probably need a third pass for most shaves. Parkers are also one of the few manufacturers out there who produce several different butterfly razor models, which is pretty cool. If you don’t mind an aggressive shave, and you want a butterfly razor, they have plenty of options. Keep in mind, though, that their 3-piece razors tend to get better reviews than their butterflies. One of the major drawbacks of Parker safety razors, for us, is the quality. The finish, weight and paint just isn’t as good as most of its competitors. Even the “heavyweight” models aren’t very heavy, which lends a cheap-ish quality to the whole line. Additionally, the chrome finish is occasionally shoddy, giving the impression of a company that is cutting costs by using a second-rate factory. Lastly, the experience of Parker’s razors varies pretty widely depending on which model you buy. Overall, there’s a lot of room for improvement. However, we do recommend a few select models. Check them out below. If you are new to wet shaving and are tired of going into work with little bits of toilet paper on your face from all the cuts your new razor has inflicted – keep reading! We know that wet shaving has a bit of a learning curve to it and can be rocky at first. We want to make the early days of using a safety or straight razor as easy on you as possible, so here are some common mistakes that newbie shavers make and how to fix them. This is one of the common ones that we here and it’s such a simple step to get a better shave, yet so important. Showering before you take a razor to your face will make your shave faster and closer. Try to make this a part of your routine, even if you have to put a sticky note on your mirror as a reminder. Just wash your face, guys. It is kind of hard for your shaving cream or shaving soap to do its job properly if it has to battle with another group of ingredients. Plus, we think there are some chemicals in pre-shave soaps that might not feel too good on freshly shaved skin and there will be contact between the two if it is not washed off. You definitely need your shaving soap puck to fit into your bowl with enough room to make a lather and if there is room to wiggle (literally) that’s great. If your shaving bowl is too small, you will probably want to load your brush and then move onto face lathering. This process works, but isn’t as easy as whipping up a lot of lather in a bowl. Tapping your razor over the sink and darting in and out of the running faucet for a nano second isn’t going to get it clean enough in between passes on your face. Your best bet is going to be to give it a decent swish in a sink with standing water, letting the water drain, filling it up again and repeat for the next pass. This routine seems to give a razor just the rinsing that it needs to finish up the job. Lather that could pass for toothpaste is not your friend and needs more water to get to the right texture. Trust us, you do not want to drag your razor through that gunk and then have to clean it out while you try to stem the flow of the cut you earned in the process. First of all – OUCH! Secondly, think of it this way: no lather, no shaving. They are the mac to each others cheese and the peas to each others carrots. It’s as simple as that. Use your senses when shaving. If you see, hear, smell or touch anything that doesn’t seem totally on point – stop and see what’s up. You will avoid a whole heap of issues if you listen to your razor. Remember all the petty gripes we had in the paragraphs above? This razor solves pretty much all of them. This is a long, heavy, butterfly-style razor. 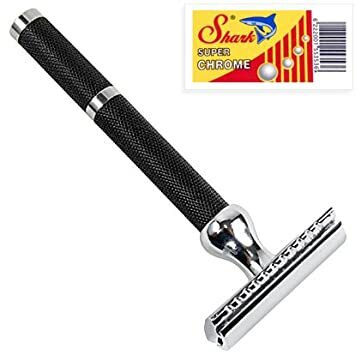 Although it’s labelled “super heavyweight,” this razor still isn’t incredibly heavy, but it’s definitely got a bit of heft to it – just enough for it to feel nice. The weight is nearly perfect, really, wonderfully balancing the control you need to handle the razor and the weight it needs to burn through your stubble. In short, it shaves great. The handle is a bit long for my taste, but most guys like it. 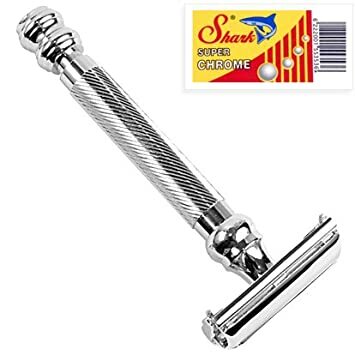 The whole razor has a chrome finish, and the handle is textured. Aside from looking cool, the textured finish makes it much easier to handle when wet, which we appreciate. This is a butterfly razor, so the head opens instead of detaching. The butterfly design works well for this razor – both functionally and aesthetically. This is one of the most popular razors in the Parker line, and it’s easy to see why. Overall, this is a very enjoyable razor to use, and it sidesteps some of Parker’s weaknesses. The Parker 71R is one of Parker’s 3-peice razors with an open comb. It’s build on a brass frame and weighs 2.8 ounces – so not super heavy, but it still has a nice balance. The handle is a bit shorter than we expected, but it’s not unmanageable. The razor comes with a textured matte black finish, which looks pretty slick in a bathroom, especially if you pair it with a shaving stand and/or have dark bathroom accessories. The head is relatively flat compared to some of Parker’s other razors, so the shave isn’t quite as aggressive as you’d expect. Still, it’s probably a bit too aggressive for beginners. One thing to watch out for, however, is the razor alignment. Several reviewers have noted that the blade doesn’t line up properly, which is a good way to cut yourself. We didn’t have that problem, but it’s a major quality issue. Just something to look out for. The Parker 82R is another “super heavyweight” razor, and we like it for a lot of the same reasons we like the 99R. It’s supposed to be “super heavy,” but we found it to be just right. Noticing a bit of a trend? 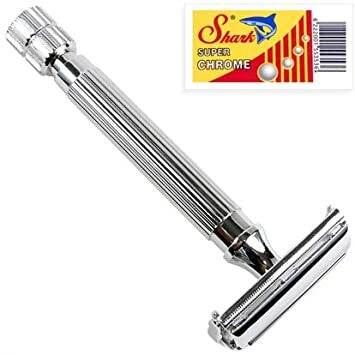 The heavier razors just tend to feel like higher-quality razors, which you can see reflected in the reviews on Amazon. The Parker 82R safety razor is a butterfly razor with a chrome finish. There’s a knob on the bottom that twists to open the doors to open the razor so you can replace blades as needed. The handle sports long groves down its length. This texture doesn’t provide quite the same level of control as the texture on the 99R, but it still handles nicely when wet. Like most Parkers, this razor gives a pretty aggressive shave, so it’s not for the faint of heart. Still, the weight and handle design give it a nice balance. All in all, it’s definitely worth the $30 or so you’ll spend on it.